Apterae of Essigella californica are spindle-shaped and have very short 5-segmented antennae (cf. Eulachnus aphids which have longer 6-segmented antennae ). The thorax is grey-green and the abdomen pale lime green, with or without rather faint brown dorsal spots. The legs of Essigella californica are variably pigmented, often mainly pale but with the tibiae darker. Abdominal tergites II-IV each have a transverse row of 6 spinopleural hairs, and 2 marginal hairs on each side. Abdominal tergite VIII has 6-8 hairs. The second hind tarsal segment is less than 1.9 times as long as the first hind tarsal length. The images below are both of Essigella californica recently discovered in UK. The alate (see second picture below) is green, again with rather short 5-segmented antennae. The identity of this new species for Britain was confirmed by the UK Food and Environment Agency (Fera) molecular diagnostics team, who compared our sample with verified specimens of Essigella californica from a New Zealand population: the COI gene was sequenced for both samples and found identical (Reid et al., 2015). Essigella californica has a sexual reproductive stage at high altitudes in North America, but are only parthenogenetic elsewhere (Sorensen,1994). 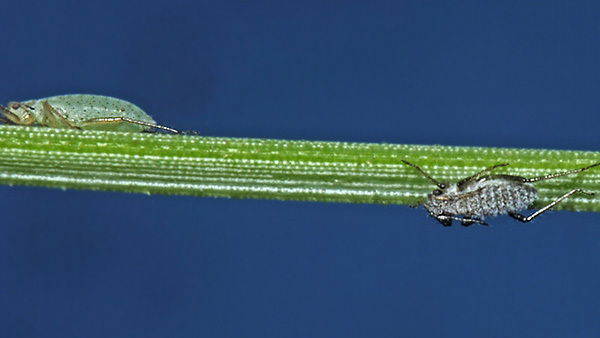 The Monterey pine needle aphid is native to North America, from British Columbia south to Mexico. In recent years it has been introduced into Europe (France and Spain) and we now have two confirmed sightings in Britain (in Kew, and our own observations in Kent). We found it on several Montezuma pines (one of its natural hosts in America) growing in the Bedgebury Pinetum. Essigella californica has also been found in Australia, New Zealand and Brazil, and is considered an invasive pest. Our observations are the second record of Essigella californica in UK to date. Wharton et al. (2005)described Essigella californica as being a highly excitable and mobile aphid that feeds singly on needles rather than in colonies. At the slightest disturbance they hide at the bases of the needles. Wharton et al. 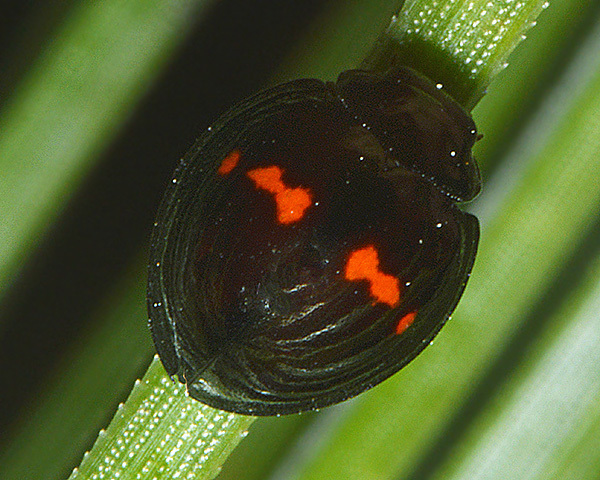 (2004) showed that the apterous morph develops through three nymphal instars, rather than the four typical of aphids. This is known for another lachnine (Cinara cupressivora), but for that species the nymphs need to be large at birth, and have stylets long enough to exploit the stem, and the adults are branch feeders. One might expect that the lower number of larval instars would increase the species' intrinsic rate of natural increase (rm) relative to other aphid species. In fact, whilst the development time is certainly shorter, the fecundity is lower. Hence rm is no higher than for other lachnid species. 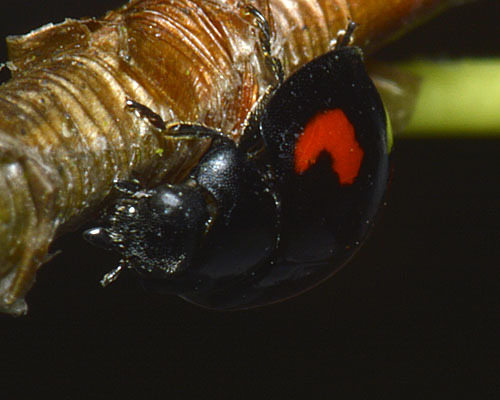 They suggested instead that the loss of a nymphal instar facilitated predator avoidance, although exactly how is unclear. Perhaps a short development time enabled them to reproduce at high altidude during short warm periods. For the population at Bedgebury Pinetum, the commonest cohabitee of the Montezuma pine needles was Eulachnus rileyi (see first picture below). They were sometimes present on the same needle, but always on the opposite side of the needle to the Monterey pine needle aphid (see second picture below). Triapitsyn et al (2015) looked at the natural enemy complex of Essigella californica in southern California, USA, where it is under effective natural control. Only one primary parasitoid, Diaeretus essigellae was reared. The associated hyperparasitoids were Asaphes californicus and Pachyneuron aphidis, plus a Dendrocerus species, and the encrytid Syrphophagus aphidivorus. Insect predators of Essigella californica were thought to play a much smaller role in its natural control. 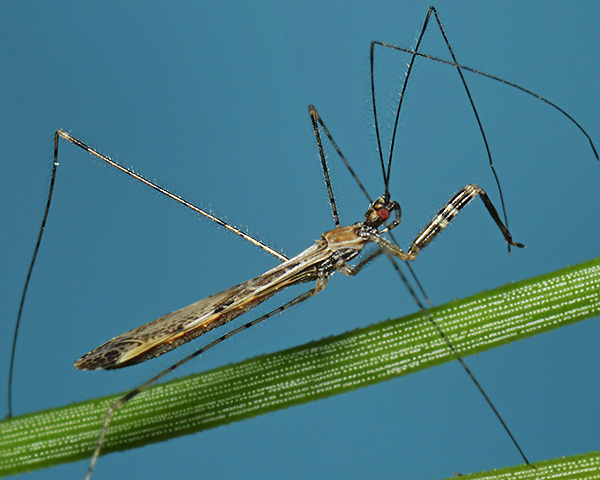 Another potential predator was a fascinating hemipteran called the thread-legged assassin bug (Empicoris vagabundus, shown below) which has previously been reported as preying on aphids. 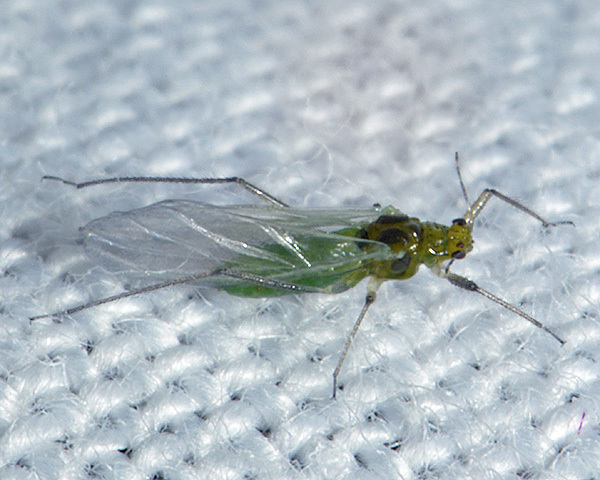 Essigella californica is a pine aphid native to western North America. It is an invasive pest in Australia that has the potential to cause severe economic loss to the Australian forestry industry. Wharton & Kriticos (2004) developed two CLIMEX population models to predict the Australian and global distribution of Essigella californica under current climate conditions based upon the aphid's known North American distribution. The first model (model I) was fitted using the reasonably contiguous set of location records in North America that constituted the known range of Essigella californica, and excluded consideration of a single (reliable) location record of the aphid in southern Florida. The second model (model II) was fitted using all known records in North America. Model I indicated that the aphid would be climatically restricted to the temperate, Mediterranean and subtropical climatic regions of Australia. In northern Australia it would be limited by hot, wet conditions, and in more central areas by hot, dry conditions. Model II is more consistent with the current Australian distribution of Essigella californica. The contrast in geographical range and climatic conditions encompassed between the two models appears to represent the difference between the realized niche (model I) and fundamental niche (model II) of Essigella californica. The difference may represent the strength of biotic factors such as host limitation, competition and parasitism in limiting geographical spread in the native range. This paper provides a risk map for Essigella californica colonization in Australia and globally. Essigella californica is likely to remain a feature of the Australian pine plantations, and any feasibility studies into establishing coniferous plantations in lower rainfall areas should consider the likely impact of Essigella californica. Essigella californica has been recorded from 36 Pinus species. Blackman & Eastop list about 170 species of aphid which feed on pine worldwide. Of those aphid species, Baker (2015) lists 19 as occurring in Britain: Cinara acutirostris, Cinara brauni, Cinara nuda, Cinara pinea, Cinara pini, Cinara pinihabitans, Cinara schimitscheki, Essigella californica, Eulachnus agilis, Eulachnus brevipilosus, Eulachnus rileyi, Pineus pini, Pineus cembrae, Pineus orientalis, Pineus pineoides, Pineus sylvestris, Prociphilus pini, Schizolachnus obscurus and Schizolachnus pineti. 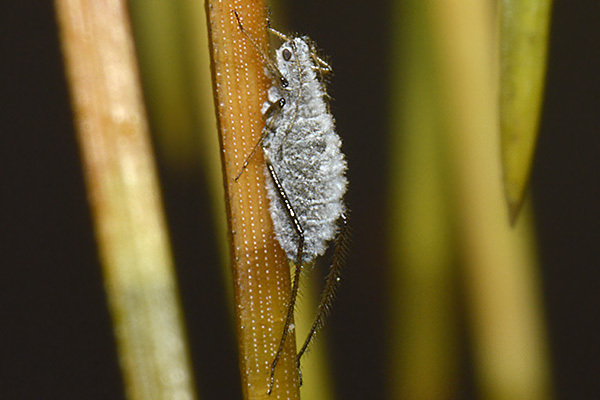 The Monterey pine aphid (Essigella californica) was accidentally introduced into Australia from the northern hemisphere before being detected in Canberra in 1998. Feeding on some members of Pinaceae, including the commercially important Monterey Pine (Pinus radiata), the aphid has now spread to almost all pine-growing areas - and is considered to be an important forestry pest. 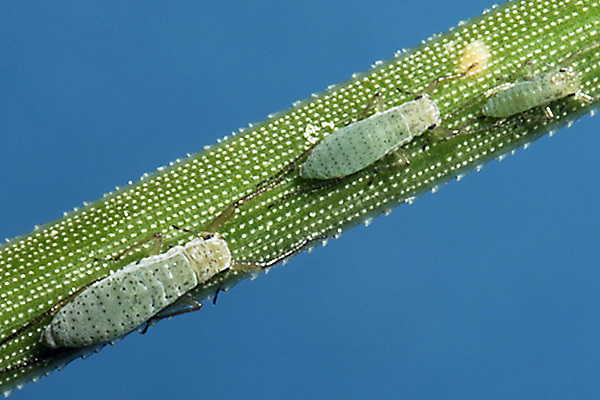 Since the appearance of Essigella californica in Australia in 1998, outbreaks of the aphid have been associated with atypical needle yellowing, premature senescence and defoliation of Monterey pine plantations across Australia. Carver and Kent (2000) give accounts of two related, exotic lachnine aphid species colonising Pinus species in eastern Australia. Essigella californica is now abundant and widespread on Pinus radiata in south-eastern Australia. Its economic importance is discussed. Eulachnus thunbergii is commonly to be found on other, less extensively planted, species of Pinus in north-eastern New South Wales. May & Carlyle (2003) investigated the relationship between defoliation and productivity loss of trees in the Green Triangle region in south-east South Australia and south-west Victoria following the arrival of Essigella californica in the area in 1999. There were strong relationships between: (1) estimated defoliation in 1999-2000 and increase in litter phosphorus content , (2) defoliation and reduction in growth of selected trees (3) defoliation and reduction in growth of entire stands. There was also evidence that the same trees were being defoliated each year. Estimated defoliation across the sites increased from 7.7% in 1999 to 20% in 2001. Estimated loss in productivity across sites increased from 2.0% in 1998-1999 to 6.2% in 2000-2001.The reduction in growth between 1998 and 2001 was estimated to equate to a total loss of wood volume in the region of 230,000 m3 valued at 6.9 million dollars. Hopman et al. (2008) examined the impact of repeated defoliation of Monterey pine by Essigella californica over a period of 8 years. Defoliation of untreated Monterey pine gradually increased to 50%. Repeated infestations gradually increased the percentage of trees with severe defoliation, indicating that nutrient-deficient trees have a reduced capacity for foliage recovery between episodes of peak infestation. In contrast, treatment with nitrogenous fertilizer in combination with sulphur and phosphorous-corrected deficiencies of these nutrients, raised levels of total nitrogen in foliage and reduced defoliation to approximately 20%. 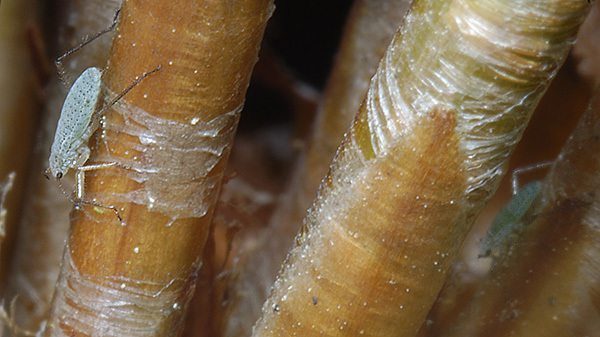 The reduction in defoliation under conditions of balanced tree nutrition was most likely due to enhanced needle retention following correction of phosphorus deficiency as well as greater availability of nutrients, which enabled a more vigorous recovery of Monterey pine after an episode of Essigella californica activity. Treatment with fertilizer therefore reduced the long-term impact of aphid damage and improved growth of Monterey pine. Eyles et al. (2011) assessed crown health and tree growth in southern New South Wales, Australia during 2006-2009 to quantify the relationship between natural aphid-induced defoliation and growth loss at the individual tree level. Over the course of the four years, particularly in 2006, trees were subjected to moisture stress, as indicated by average annual rainfalls that were below the long-term average. In general, the diameter growth of individual trees appeared unaffected by crown damage severity across most tree ages, indicating that the productivity in Green Hills was limited by the interactive effects of climatic and biotic stressors (both cause premature loss of foliage). Furthermore, the results from this four-year experiment demonstrated that both moisture stress and aphid-induced defoliation constrained the growth response to thinning. However, thinning may have assisted damaged trees to maintain growth rates similar to trees with little or no damage. Their results highlighted the difficulty in quantifying the effect of aphid-induced defoliation when combined with chronic moisture stress. Essigella californica was first recorded in New Zealand near Whangarei, Northland, in 1998. Since then it has spread throughout most of the country. Flynn et al. (2003) presents New Zealand distribution data from surveys undertaken after its detection in 1998. Flight data from aphid suction traps and a review of the hosts of Essigella californica are also presented. Essigella californica is recorded from the North Island and the top half of the South Island. Recorded hosts include several species of Pinus and Pseudotsuga menzieii. The main period of flight activity occurs between January and April. Appleton et al. 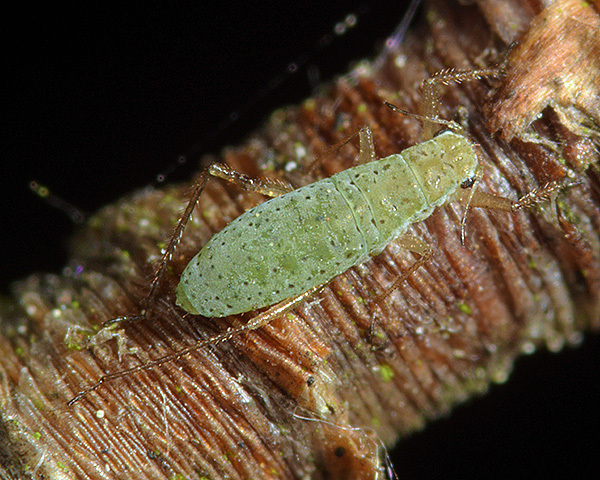 (2003) monitored Monterey pine aphid populations in the Bay of Plenty forests of Rotoehu and Kaingaroa in New Zealand over two years to determine what influence Essigella californica has on the health of Pinus radiata, and to identify any associated predators and parasites. Populations were sampled throughout the canopy height of forests stands at three altitudinal ranges and three age classes. Findings clearly showed that although Essigella californica populations vary markedly from one year to the next, highest populations occurred in low altitude, mid-aged Pinus radiata in autumn. Even at relatively high population levels in mid-aged stands, Essigella californica did not appear to have any visible effect on tree health. Their monitoring programme showed that Essigella californica cannot be considered a pest of Monterey pine in New Zealand. Watson et al. (2008) examined the impact of Essigella californica on the health and growth of Monterey pine in New Zealand by comparing trees treated with a systemic insecticide with untreated trees at two climatically contrasting sites over three seasons. Upper crown yellowing, thought to be associated with Essigella californica, was not affected by insecticide treatment. However, on insecticide-treated trees aphid numbers were reduced and tree diameter increased in the final year at both sites. Significantly more aphids were recorded at McLeans Island Forest than Kaingaroa Forest in all years. The incidence of the needlecast fungus (Cyclaneusma minus) was also greater at McLeans Island, in support of a possible relationship between Essigella californica and Cyclaneusma minus. Compared with its effect in Australia, Essigella californica appeared to have a low pest status in New Zealand. 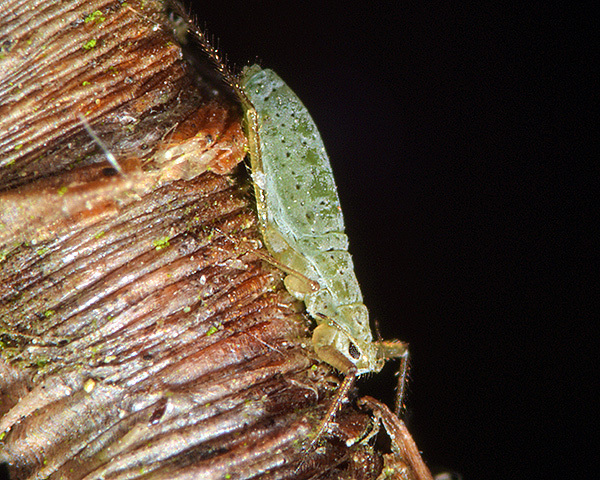 Elmsavers (2010) report treating this insect pest in susceptible Pinus species by tree injection. They treated the Canary Island Pines within the gardens at the Burnley Campus, which is a part of The University Melbourne. Tree injection using neonicotinyls was the most effective method. It can be undertaken throughout the year offering long term control in resinous coniferous trees. Kimber et al. (2010) describes how a project was commissioned in 2005 to import the parasitoid, Diaeretus essigellae, into Australia and subject it to host-specificity testing with a view to releasing it as a biological control agent for Essigella californica. 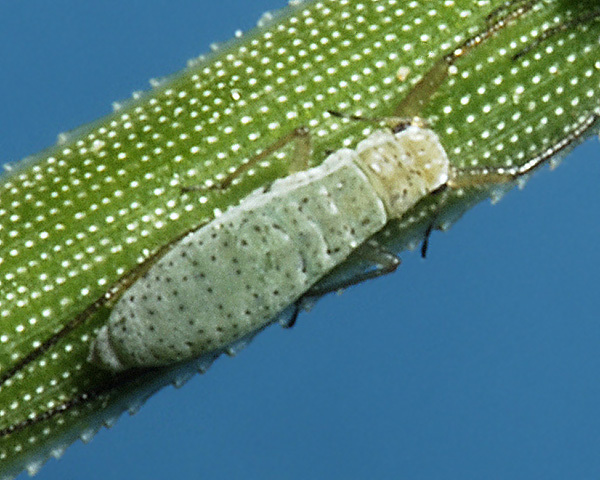 No-choice and choice host-specificity testing was conducted using Monterey pine aphid and eight non-target aphid species as potential hosts for Diaeretus essigellae. Regardless of the testing procedure, Essigella californica was the only species that was successfully parasitized. 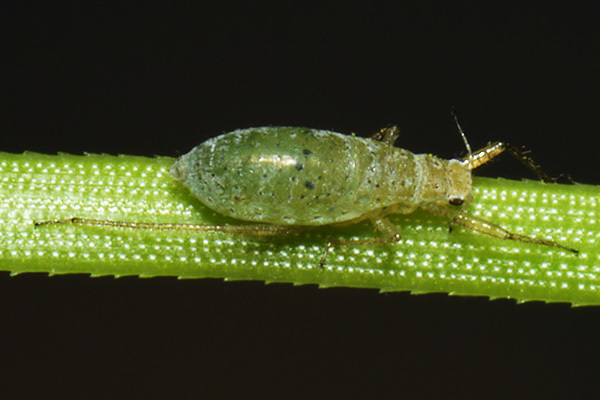 This suggests that Diaeretus essigellae is highly specific (at genus or species level) and therefore, is a suitable candidate for release into pine plantations to provide control of Monterey pine aphid in Australia. Based on these data, permission to release the wasp from quarantine was granted in November 2009. Latest reports on this introduction appear promising. Sue Shaw, the research coordinator at HVP Plantations in Australia has posted a video about the Diaeretus release programme.